As part of my summer sojourn into the recent past, I finished playing the first Assassin's Creed. Despite its flaws, I enjoyed my time with the game and its surprisingly dense environments. Although there is plenty of repetition in terms of character models and ambient dialogue, I feet that the game captures the essence of what it is like to walk through a crowded city. In particular, Assassin's Creed's beggars and panhandlers give the game's world a recognizable, albeit sad, sense of authenticity. When I play open world games, the environment usually becomes a glorified obstacle course. The skyscrapers in Infamous become obstacles and the vast expanse of Red Dead Redemption acts as dead space between settlements. Human NPCs quickly become moving set dressing that I usually ignore unless I see a colorful "!" above their head. These familiar quest-givers exist in Assassin's Creed, but so do beggars, whose actions influence the game more subtly. rejection ("My taxes help him...I give to charity...It's probably a scam...He'll just end up buying booze, etc.") and stay focused on the task at hand. I'm sure overthrowing the Templars will do more for the downtrodden a few shekels. Their plight, tragic as it was, could not be solved with a blade and was thus relegated to the back burner. Try as I might to live on the rooftops and take in the city as an elevated observer, I often found myself on the ground, surrounded by the people I sought to ignore. Though Assassin's Creed has no formal "morality" system, panhandlers do present a dilemma. I routinely found my progress slowed by an insistent beggar. As arrows zipped past my head, I cursed the pushy panhandlers that had knocked me into a group of surly guards. Occasionally, I'd lose my temper and shove people to the ground and out of my way. Any satisfaction in doing so was short lived: aggressive actions either alerted the guards or elicited jeers and disapproving shouts from other citizens. At times, it was hard not to feel like a jerk, even though I knew they were only virtual people. 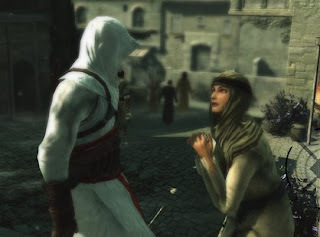 For me, the beggars in Assassin's Creed demonstrate that games don't have to express morality quantitatively in order to effectively explore the concept. True, being rude to the beggars invites mechanical penalties, but their biggest impact comes on an emotional level. The beggars were designed to frustrate me and they did so splendidly: I was frustrated that they were getting in my way, frustrated that I couldn't do anything to help them, frustrated that I would sometimes give in selfishness and treat them cruelly, and frustrated that all of these feelings were uncomfortably familiar. Turning the game off silenced the pleading, desperation, and hostility of Assassin's Creed's world. I could walk away, confident in my powerlessness. I couldn't help those people; it just wasn't in the programming, but I still felt a twinge of guilt now and then. Such twinges were sharpened when I realized that my attitude towards medieval Jerusalem's poor was a derivative of my experiences in real, contemporary cities. Retreating into the relatively luxurious privilege of my daily life doesn't mean that San Francisco's streets have been switched off. Helping real people might not be simple or easy, but it is possible, which makes the similarity between my responses to virtual and real panhandling all the more troubling. I'll be interested to see how your experience in AC2 and ACB compare. In those games, you can recruit the beggars and prostitutes and other street "undesirables" to work FOR you.. So rather than becoming obstacles, they prove invaluable while the arrows are whizzing past your head. And of course they finally did the sandbox thing right in those sequels, and they're just really, really fun to play. That does make me more interested in those second two games. In a way, it sounds even weirder, as you're basically using them as tools. Whatever the case, I'm looking forward to it! It's funny how sometimes I don't even judge games as "good" or "bad" anymore, instead it's more about how interesting a game is to look at in certain parts. Take the first AC for example, it's basically the freakin' tutorial extended to a twelve hour game, however it's so interesting to see how they struggled to fill the beautiful environment with some sort of actual gameplay (and for the most part completely failed). I mean did you realise how weirdly that game is structured with a linear beginning and ending and how they really didn't know what to do in between? Is AC a great game? Probably not but it's still an interesting one to look at and play. Kinda like Gears 2 trying the emotional story take and completely failing might have been the most interesting thing in the entire game. It's funny how my perspective on games changed, once I started approaching them like that. And it also makes you feel really stupid when you see how AC2 might be a much better game but you somehow don't feel that same connection to it because at the same time it lacks those rough edges that sometimes make you think about games in general, like AC1 did.